You may have noticed that Project Refresh stalled out before it got rolling along at full speed. Well, at least that’s how it appears on my blog. In my home, and in my head, it’s a slightly different story. See, in the weeks since I finished covering my bench (Project Refresh Project #1), I have been on a quest to come up with a new color palette for my home. I started by pinning color palettes on Pinterest on my Home Decorating Ideas board and scrolling through old pins that I’ve been collecting for several years. Browsing through this board makes it pretty clear what I like: a neutral foundation with pops of aquas, greens and yellows. As helpful as this was, I was still struggling to to translate my Pinterest inspiration into specific paint colors. So I turned to a friend for help. She suggested browsing through magazines. How old school, right? But it was oh so helpful! I collected all of my remaining Better Homes and Gardens magazines, and started flipping and tearing. I came across many color palette ideas, as well as many tips for selecting colors for your home. 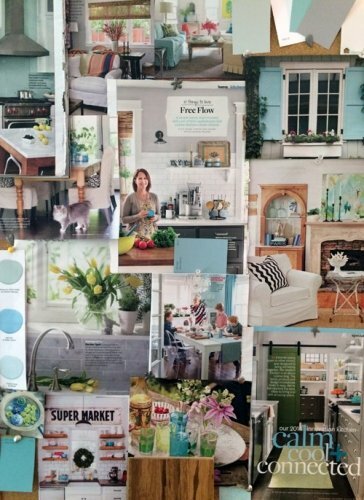 One of my favorite tips was to create an inspiration board. I loved this idea because it would allow me to collect all of my favorite ideas into one visual collection, and add in paint chips, flooring samples and fabric as well. My next step will be to purchase paint samples, and paint some swatches right on the wall. If you’ve never tried this before, it’s a terrific way to see your paint colors in a variety of lighting situations so you’re sure to select a color you’ll love anytime of day. After that, I’ll just have to figure out what to paint first, upstairs or downstairs. I’ll keep you posted on my selections and progress. What is your process for selecting paint colors? Do you have any tips to share? I’d love to hear from you! Hey Aby! We’re in the middle of our repainting project. I love how it all looks in the end but the paint choosing process is probably one of the hardest parts. Even though I knew the color I wanted in my head, finding that color on a swatch was quite difficult. It was just a neutral beige, but do you know how many beiges there are!? I have lived with a cool gray for the past five years which I loved, but it was just time to move on to something a little warmer. I used many of your tactics, including painting swatches on the wall. Which by the way, one tip I have seen is not to paint it right on the wall but on poster board and then move it around the room as lighting changes throughout the day. Whose got time for that though? After coming up empty, I finally remembered where the desire for this warm beige came and it was from an airbnb apartment studio my husband and I had stayed in on a couple weekend aways. So, I contacted the owner and just asked if he might know the paint color. And as simple as that I had the color I wanted. So my advice is if you see a color somewhere that you love, whether it is a boutique, a restaurant or wherever -just ask? It’s worth a shot! How fun that you’re painting, too! Great idea to ask when you find a color you love. I’m so happy you were able to track down your warm beige. And funny…I’m moving from a warm yellow, to I think, a cool beige. I FINALLY painted my master bath. Magazines and Pinterest were definitely my inspiration as well. I had little swatches taped on my wall for months! I finally bought paint samples and painted 1’x1′ sections; only to discover that none of them worked! Back to the paint store I went. I picked out 6 new colors – repainted my walls and finally found the winner. I highly recommend this. Too bad I wasted months looking at little bits of paper. You worked hard to find the just right color! So glad it all worked out. Aby: Could you ask Kelly what the name of that beige color was? I really like that blue, it makes the room pop. Trisha, the color is Toasted Almond by Olympic. I’ve been a fan of your website for several years now, but this is my first comment! This is what my mom taught me and it has worked EVERY time! After you choose the color that you like, always, always go 2 shades lighter. The couple of times that I didn’t use this trick. . . I ended up repainting because it was too dark. Hope this helps! Thanks so much for posting your first comment. I’m thrilled to hear from you after all this time. And thanks for the great tip! I will definitely keep that in mind. It is so funny how different pant looks on the wall, isn’t it? Hi Aby, Love your pinboard! We are planning a remodel of our home and I have been collecting ideas for our kitchen, bathroom, and a bunk house, so far. I have been using a file folder to contain the ideas but I love the idea of a pinboard. Ideas are right out in the open! I am loving the pin board! I have it propped against a wall in my great room, and it inspires me every time I walk by. Let me know if you create one, too. It’s been a number of years since I’ve chosen paint colors, but I was never able to tell anything from the paint chips. I like Benjamin Moore paint, so, when I needed a sunny yellow for a bedroom, I went to their interior design section (don’t know if they even still have that) and told her what I wanted. She picked out a chip that looked like yellow baby poop – I kid you not. Had a yellowish brown tinge. She swore to me it would come out deep sunny yellow and lo and behold it did! Exactly the color I wanted and I would NEVER have chosen that chip. So I used that resource in picking other colors because I figured they saw their paints all the time and they knew what it would look like on the walls. One tip that I’ve never regretted. If you don’t mind a slight sheen with your paint, choose eggshell or a satin finish. With dark colors, this finish won’t cause a whitish mark if someone brushes up against the painted wall. With all colors, no matter how dark, you can simply wipe the walls down with a damp cloth – easiest cleaning paint finish I’ve ever seen and all the rooms I’ve used it in have not needed a touch-up in 20+ years. Thanks for the suggestion, Deborah! You made me remember that I did something similar when I picked out a color for my office. I took in a photo from a Pottery Barn book, and the lady at the Benjamin Moore dealer in town asked me which way the room faced, how much light it got, etc. and picked out a swatch for me. I never would have picked the one she did…and I love it! Guess it pays to ask the experts. We moved into our house a year ago and had to repaint the entire house. We are almost done. It was very challenging to figure out colors but so far I’m happy with how it turned out. I started out with basic color ideas for each room and then got several paint chips. Now there is a product you can buy that has a clear piece of plastic about 12 x12. You test your paint on this clear plastic. Then you stick it to the wall and it can be moved around to different areas in your room with different lighting. It was very helpful with choosing our colors. Painting a house is a real fun. While you are painting you need to take care of lot many thing before and after painting id you are going to do DIY project. Choosing a paint is not so difficult. You must go for lighter shades while you are painting your bedrooms and living room. When your paint is of lighter shade you will need less lighting. Selecting paint color for any of the room is a very important thing. Some of the professionals make the color selection process fun. Try to approach a professional for best color suggestions.